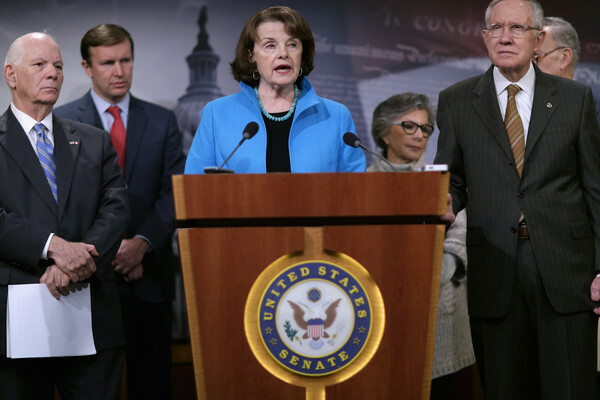 (L-R) Sen. Ben Cardin (D-MD), Sen. Chris Murphy (D-CT), Sen. Dianne Feinstein (D-CA), Sen. Barbara Boxer (D-CA) and Senate Minority Leader Harry Reid (D-NV) hold a news conference about Democratic legislative proposals in the wake of last week's terror attacks in Paris at the U.S. Capitol November 19, 2015 in Washington, DC. Senate Democrats proposed tightening the visa waiver program, requiring more biometric information and e-chip passports from overseas travelers visiting the United States and closing a loophole that allows people on the Terrorist Screening Center's No Fly List to purchase firearms or explosives. "If you are too dangerous to board a plane then you are too dangerous to buy a gun," said Feinstein.